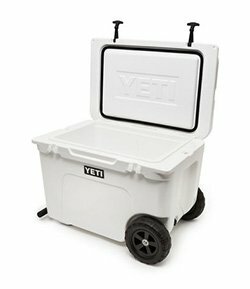 Where to buy Yeti Haul? This is one of those things that are supposed to be so obvious they leave you wondering why they didn’t come much sooner. If you deal with coolers regularly (as we do) and have to carry them around every so often, then you know how heavy these things can get. It’s even worse if it’s a large capacity cooler. Coolers over 100 quarts in capacity simply shouldn’t be carried around, unless you’re the hulk and can do it comfortably with one hand. Imagine having to carry a full cooler from the car to the picnic area, your boat, or to the gym. If you’re carrying it to the gym, that’s a good enough warm up. It gets even worse when you don’t have someone to help you go through the ordeal. That said, there are many cooler brands that have done something about the problem. Cooler brands like Coleman and Fatboy have come up with some great wheeled coolers to make it much easier to move your stuff from point A to point B (we have reviewed more wheeled coolers here). But there has always been an elephant in the room, and that elephant has been there too long. We always acted like it didn’t exist, but there were definitely murmurs. People talked. The elephant was none other than the fact that Yeti, the trendsetters for the industry, didn’t have a wheeled cooler. Yeti has come a long way from their humble beginnings in 2006. The two co-founders give a heartwarming story on their website about how, while growing up, they were imbued by their father with a deep love and passion for the great outdoors. But they had one serious issue: all the coolers at the time were simply not up to the challenges they faced. They constantly went through problems. They would break in various parts and couldn’t survive the harsh conditions of the wild. It seemed these coolers were made for picnics in the backyard with family and tailgating parties. They were made for discount hunters and not real hunters. So they did what all entrepreneurs do when they don’t get what they want: they went out and made it. That is how Yeti was born and it has since never looked back. Today it is the industry standard for just about everything cooler. But it was still late to the wheeled cooler party. Well, the good people at Yeti finally decided to listen and they gave the fans what they wanted. 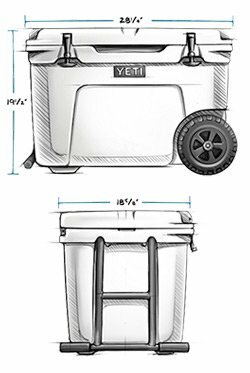 Yeti made their very first wheeled cooler, the Yeti Tundra Haul. As you would expect from a brand like Yeti, they didn’t leave any stone unturned. They went out to make the perfect wheeled cooler. Now, I don’t want to spill the beans before I get into the meat of this review, so all I’m going to say at this point is that we’re rarely as excited as we were to review this particular product. Wheeled coolers are incredible beasts. At the heart of it, all you did was take a regular cooler and give it a pair of wheels. But what you’re really doing is a ton more. You’re giving your customer the opportunity to transport their cooler while standing. When carrying heavy objects, posture matters a great deal. Now, if you’re carrying that object with your arms, the tax on your posture will be punishing. A wheeled cooler helps you escape that by allowing you to transport your things while standing. Wheeled coolers are also capable of carrying more. Because of the fact that it is wheeled, this cooler won’t have to go through any of the stresses that are associated with large coolers being lifted off the ground. Being on wheels allows it to support a much greater capacity. 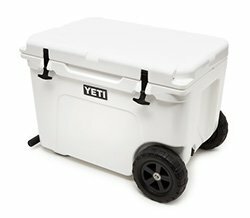 It’s no secret that Yeti’s very first wheeled cooler had to be a Tundra. The Tundra line of coolers is well known for its incredible insulation and toughness. When they made this particular cooler, they went all out. The insulation goes the extra mile, the materials are top notch, and the design has that recognizable Yeti class (find out more in our Yeti Coolers review). The capacity on this cooler is 45 cans of beer and 55 pounds of ice on the assumption that the ratio of ice to cans is 2 to 1. For something that large, you need a robust construction capable of bearing the weight. To start with, the Tundra Haul has the trademarked Fatwall Design. That means the walls are extra thick with up to two inches of insulation. That means you get some sick ice retention with this cooler. The insulation itself is made from polyurethane (Permafrost™ Insulation). The process by which it is attached to the walls and the lid of the cooler is known as pressure injection and is the industry standard for proper cooler insulation. The cooler itself is rotomolded. Yeti didn’t begin the rotomolded tradition, but they definitely popularized it. You can easily tell the difference between a cooler that has been rotomolded and one that hasn’t. The rotomolded one is a single complete body. The one that hasn’t been rotomolded has seams. That means it is more susceptible to structural stress and leaking than the one that is rotomolded. The Tundra Haul, being made to carry heavy loads, is rotomolded to be able to withstand the weights of these loads. I’ve already said a ton about the insulation which, frankly speaking, is top of the line. But what other excellent features does this cooler have? First, there’s the little fact that most of the features on this cooler have something to do with being able to withstand heavy loads and loads of stress. The first thing that caught our eyes is the hinge system. 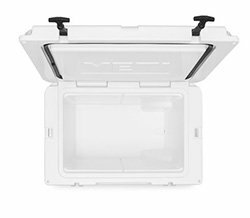 With a cooler this large, you want a hinge that’s going to be able to go through anything without so much as a scratch. That’s where the trademarked NeverFail hinge system comes in. There are two hinge pins per hinge and interlocking design that virtually guarantees your hinges are never going to break. Another feature in the same spirit is the handling system. Yes, it’s a wheeled cooler, but there will still be times when you need to carry it with your hands (like putting it on a truck). During such times, the LipGrip handles come in handy. They have been molded into the side of the cooler to make it easier to carry when moving it over short distances. That’s not where it ends, though. There’s the handle by which you pull the cooler while wheeling it around. You’ll want one that won’t break off easily, especially when the cooler is particularly heavy. You’ll also want the handle to be comfortable so your hands aren’t on fire when you’re done. Finally, you’ll want one that’s flexible enough to be pulled to the right or left so you can pull at an angle that’s comfortable to you. The handle on the Tundra Haul does all of that. It is made of welded aluminum so it’s super strong and durable. It also has a comfortable handle with good grip and a curved design that will track right or left to support your towing from any angle. The latches, as usual, are the same old recognizable T-Rex lid latches. They’re heavy duty, they’re made of rubber, and they’re made out of patented technology. None of us on the team has ever once had a problem with a busted Yeti latch. The ones on the Tundra Haul do not disappoint. Anf finally, crème de la crème – the wheels. The wheels on the Tundra Haul are perfect. They’re fairly large, meaning they get to comfortably move your cooler around. They’re also made from a single piece construction that won’t puncture easily or bruise upon impact. These wheels will serve you for many years to come. From the beginning, the Yeti Tundra Haul will be available in one of four colors: white, desert tan, ice blue and charcoal, so pretty much everyone should find something suitable here. As usual, Yeti didn’t say much about the ice retention capabilities of this cooler. However, based on past experience with Yetis, we pretty much expected a good figure. We didn’t get to experiment with the cooler and find out how long it can hold ice for because it’s not out yet. It’s a model that’s coming soon so it’s not on the market just yet. However, we’re excited about it and, based on past experience, we bet it’s going to keep your ice icy for at up to 10 days (depending on outside conditions of course). TIP: To maximize ice retention you may try using pre-chilled ice packs. Here are the ones we recommend. Like we said earlier, Yeti came a little late in the wheeled cooler game. As a result, there’s already some stiff competition out there that Yeti has to deal with, especially from cheaper brands. Let’s look at 3 of the best and find out how they hold up on their own. The Pelican ProGear Elite cooler is the best of the best. It is a top of the range cooler in terms of both performance and price and has some pretty cool features that you will appreciate. The ice retention on this cooler is 10 days. For a cooler of this size, that’s way better than the industry standard of about 7 days on average. You can take it out with you on a fishing trip and expect this cooler to do its job. The insulation is just like the Yeti’s: Polyurethane. It also has freezer grade gasket to match the one on the Yeti for extra insulation. The way we see it since the Pelican came first, it would seem Yeti took quite a bit of inspiration from this cooler. The latches are different than the Yeti’s, though, since they’re press and pull latches while the Yeti’s latches are T-Rex rubber latches. They’re pretty strong, but they’re no T-Rex’s. Overall, the Pelican ProGear matches the Yeti’s offering pretty well, only it’s more expensive than the Tundra Haul, which is a first whenever we’re comparing another brand to the Yeti. 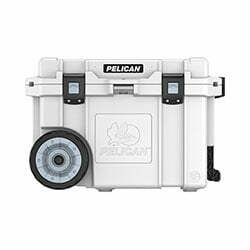 Check our Pelican vs Yeti comparison or check its Amazon price here. 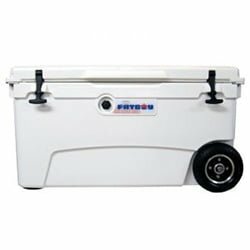 The Fatboy wheeled cooler has a great capacity of 70 quarts, which is pretty good. Fatboy is a relatively new brand on the market looking to carve a niche for itself by making affordable coolers that give you almost all of the features you will get on more expensive brands. The Fatboy has T-Rex latches, just like the Yeti. They have a special feature though: they don’t come off easily and don’t feel loose like the rubber latches on most other coolers. The Yeti’s latches are okay, but we feel the ones on the Fatboy are way better. The lid on the Fatboy is non-slip, the bottom non-skid, and there is a vacuum press on the side to help you open the lid. That’s something we couldn’t find on the Yeti. The plug on the Fatboy also has both an outer, smaller plug, and a lower one for higher volume drainage. It’s a great cooler all-round. Check our Fatboy Coolers review or get it on Amazon. The Coleman has a capacity of 62 quarts. As far as large coolers go, this one is pretty cheap. It’s the cheapest wheeled cooler we know of. However, it has some serious shortcomings to it. It isn’t rotomolded, it only retains your ice for 5 days, and it isn’t as durable as the Yeti. 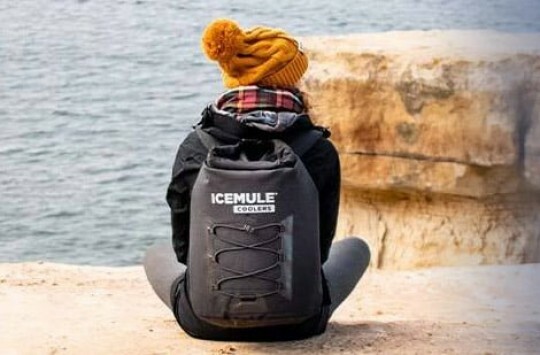 We can’t say much for it, except that if you absolutely need a cheap wheeled cooler that you’ll have to replace in a year or two, then this is the cooler to buy. Check our Coleman Xtreme Cooler review or get it on Amazon. Yeti, of course, wins the day against 2 out of 3 of the coolers above. The only close competitor is the Pelican. 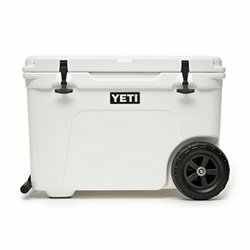 However, Yeti still holds its own, even as a new player in the wheeled coolers market, and buying yourself a Tundra Haul would be a good move. However, if you want something a little more affordable but still okay, then you can buy the Fatboy. If you want downright cheap then the Coleman is for you. 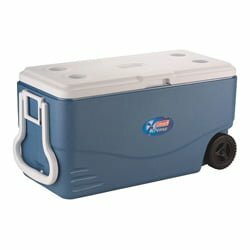 Do you already have a cooler and feel a bit iffy about going out there and buying a brand new cooler just because it has wheels? We understand. Don’t worry, we went out and did all the research for you. There are actually plenty of vendors who will fit your existing cooler with wheels. From the Yeti to the RTIC, these wheel kits feature some large wheels and high quality, low maintenance designs that will last you and your cooler for many years. The construction is typically stainless steel (which is more rust-resistant than other metals) with aluminum locks for attaching to the cooler. The tires have very wide diameters, the axles are very strong, and the straps are specially made for comfortable pulling. The most obvious answer to this question would be Yeti’s own website, of course. However, there are lots of other places you can buy their products online, including Amazon. Now, the thing about this particular cooler is that it isn’t out just yet. However, it is coming soon and you want to get it from the best platform. Amazon is a great place because not only will you be able to choose from a number of competing vendors, you’ll also be able to read customer reviews to help you make your decision. You also get great benefits, such as free shipping under some circumstances and free returns if you don’t like the product. We have always believed Yeti to be the industry leader and they haven’t disappointed us. 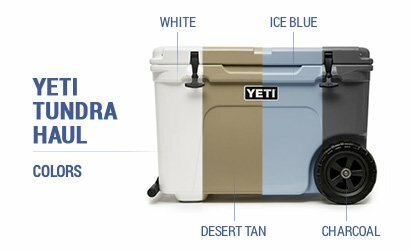 The Tundra Haul is a great cooler on wheels that maintains the Yeti tradition of high quality and high class. If you want to maintain that tradition yourself, then grab yourself one of these as soon as they hit the market. What Is A Roto-Molded Cooler And How Is It Made?